Back by popular demand, this year's Retail Boot Camp focuses on the "Foot Traffic Formula" with effective ways for creating and retaining new customers. 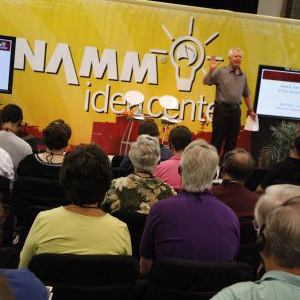 Retail expert Bob Negen presents this day-long intensive sales and marketing training session on July 10—the day before Summer NAMM begins—so you can get geared up for meetings, planning and additional learning opportunities at the show. Register today. Summer NAMM kicks off at 8 a.m., Thursday, July 11, with the powerful "NAMM Retail Summit," in its new location: in the Davidson Ballroom at the Music City Center. Led by NAMM President/CEO, this NAMM U Breakfast Session welcomes industry leaders sharing their perspectives on the present state of retailing and thoughts on the future. Dubbed the "retail Oscars" by Music Inc. magazine, NAMM's Top 100 Dealer Awards was created to spotlight the industry's very best retailers and share their stores' strategies for success. In addition to choosing the Top 100 Dealers, an independent panel of industry judges will also select winners in 7 "Best Of" categories, and from those they will select the winner of the prestigious "Dealer of the Year" award. Join us Friday, July 12 for the awards event and celebrate the most creative, proactive dealers in our industry. Submit your store before the April 30 deadline. Once again, NAMM U will offer a full schedule of Idea Center Sessions throughout the show, designed with your store in mind. Sit in on some of these quick, focused sessions presented by industry leaders to pick up tips for improving your approach to finances, technology, lesson programs and much more. Look for the session descriptions and times to be posted soon. On Saturday, the NAMM U Breakfast Session "Best in Show" presents industry panelists' picks for what you must see on the show floor before leaving Nashville! Build your relationships, see new products and sharpen your skills—make your move to join us at Summer NAMM!